You can visit the Bay of Aiguillon easily on foot or by bike, but that day we decided to go by car (with our bikes on the roof) so we could cover longer distances and visit a range of vantage points. We began our ornithological adventure at the southern end of the Poitevin Marshlands Regional Park, in the village of Esnandes, where the coast is lined by little cliffs looking out over the bay. The weather was excellent, and we couldn’t wait for this new day of our family nature holiday. We started off by wandering down the village’s streets to admire the houses designed in regional style, spending some time exploring the surprising Saint Martin’s church, a fortified gothic church dating from the 16th century and a designated Historical Monument. Its square shape is unexpected, and its main door is magnificently sculpted. Next, we followed the coast to arrive at our first stop at Pointe de la Pelle. 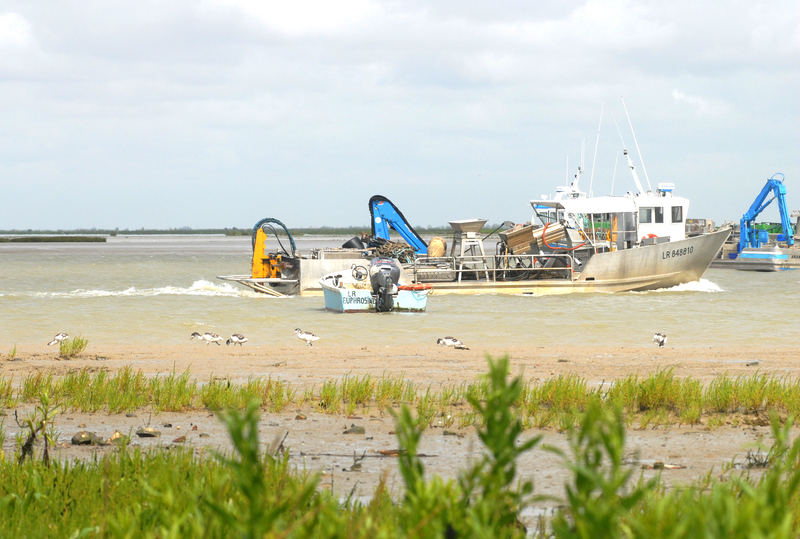 As well as being an oyster farming area, this little hamlet, which is part of Marsilly, offers a beautiful unobstructed view of the Bay of Aiguillon for admiring the birds. More than 500,000 travel through the Poitevin Marshlands Nature Park during their migration. The species you’ll see vary according to the migration period, but some have chosen to live there year-round. We decided to get a closer look. Each member of our family had their own pair of binoculars and quickly found water fowl, egrets and even a peregrine falcon. Not bad for our first stop! We then hit the road for a few miles (which turned out to be a magnificent drive along the salt marshes dotted with fishing huts), and we quickly came to Pointe Saint-Clément, where we admired the panoramic view. The weather was great, and we enjoyed a breath-taking view of the whole Bay of Aiguillon. And we had already spotted new birds. We thought we saw some black-tailed godwits flying not far from us, above the mudflats and salt marshlands. Arounds us were a few fishermen searching for prawns, photographers on the lookout for the perfect shot, and other families who, like us, had come to see the countryside and the birds. It was time to continue our journey a bit further north, close to Charron, and explore another site on the Poitevin Marshland Nature Park’s coast. This charming village is known for being a mecca for bouchot mussels. We quickly reached the little harbour at Pavé, which sits at the mouth of the Sèvre Niortaise River, to watch as the flat-bottomed boats used by oyster farmers came in, and we also spotted the famous mussel posts (bouchots) that are so typical of the area. We’d been promised that the Bay of Aiguillon, where salty sea water meets fresh water, was an exceptional place. They weren’t wrong, because after just a few minutes there, we’d already seen a few shore birds in the distance. Just a bit more patience and some elegant avocets appeared, with their pretty black bills and slender white legs. The kids were so excited to see all of these birds through their binoculars! We waited a bit longer to watch the spectacular sunset over the bay, but we hadn’t forgotten to book a table at a nearby restaurant with an ocean view to enjoy the tasty bouchot mussels. An excellent way to finish a day full of ornithological discoveries for the whole family!